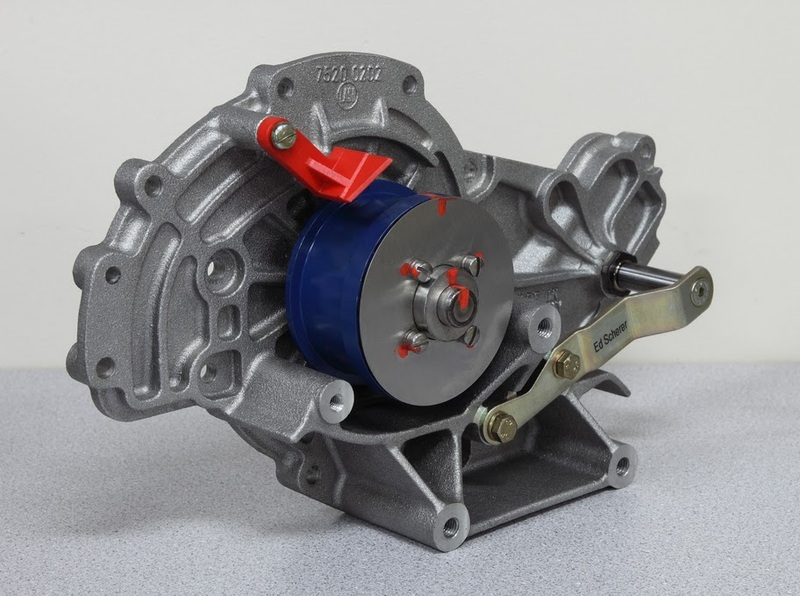 I am pleased to announce that 928sRus will be selling the new "Engine Guardian" water pump designed by Ed Standke at Perfex Manufacturing. Inc. 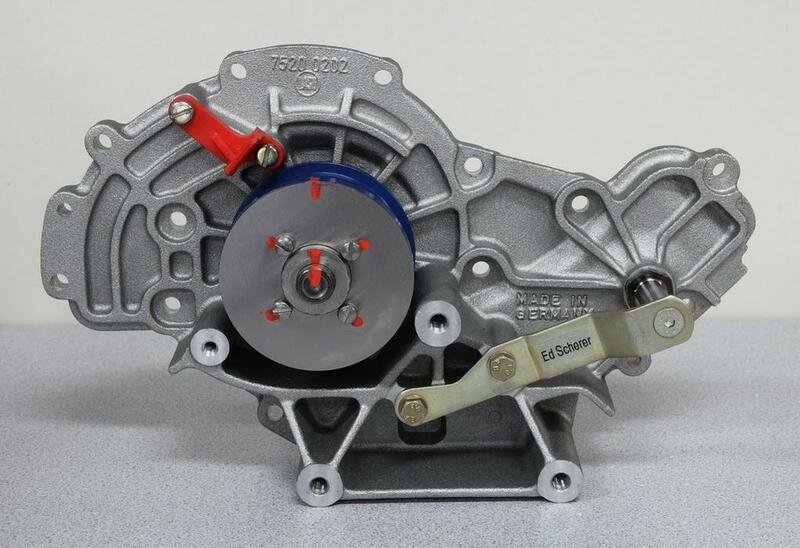 The "Engine Guardian" uses a brand new Laso plastic impeller pump modified by Ed. 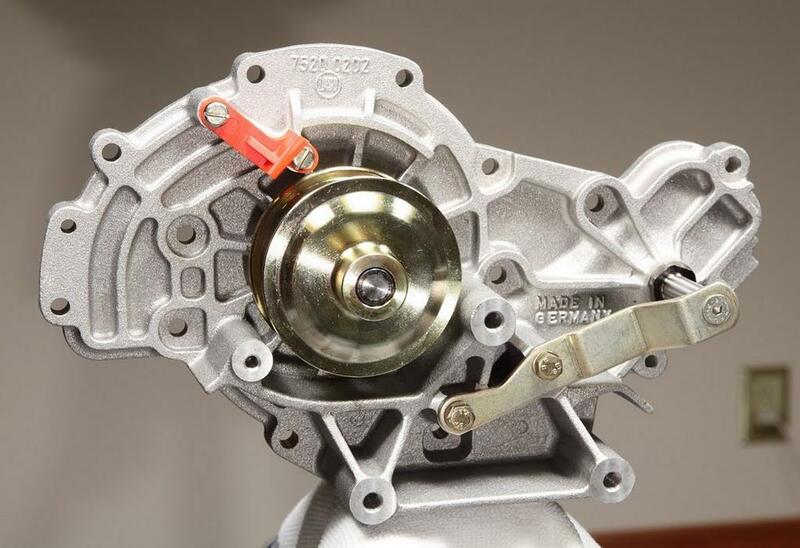 This is the ultimate water pump design and covers all the concerns we have when it comes to fitting a water pump to our cars. Initially available for 87 to 95 cars only unless you are using the PKensioner on your 78 to 86 car. I will have a number of units in stock and ready to ship within 3 weeks and I am taking orders now. Price will be $595 plus shipping. Pictures are courtesy of Ed Scherer – thank you Ed! Never leaks when we or our customers fit them. Why is it an issue for you. How many have you fitted and how many have leaked? We use a thin smear of RTV when we apply the gasket. Have you tried that or do you fit them dry? Are you saying we should take the water pumps off the market? Looks the same as the factory one. This is one I pulled off the other day. With gasket attached. Roger, I was under the impression that Ed didn't want to use a pump with a plastic impeller. Has he changed his thinking on this? With respect - I don't know what your agenda is in posting obscure statements like this - however what has this to do with the the design of the water pump that everyone wants and has waiting years for. I am all for constructive comments but in this case I do not see your point unless you have some factual offerings. I guess in your World we should all stop trying to improve the components on our cars. Not saying you should take them off the market. Can you explain why they made the bolt holes so large? The bolt is only M6. The area that the red arrow is pointing at has a reduced gasket seating area. So the leak path is from the pump waterway to the bolt hole. You can see that the leak path for other bolt holes is much longer. Laso, in increasing the bolt hole diameter, has reduced this leak path to all bolt holes, but the one I pointed out is considerable less, and possibly marginally unacceptable. I always recommend installing water pump gasket with a sealant. If they still made asbestos water pump gaskets, I would use them and install the gasket dry. From my experience, the fiber gaskets available today weep coolant which can allow corrosion of the water pump bolt threads. So, my practice is to use a gasket sealant that penetrates the gasket and promotes less bolt thread corrosion. Course, Stan has a good technique of coating the water pump bolt threads with a non-hardening thread sealant upon assembly. 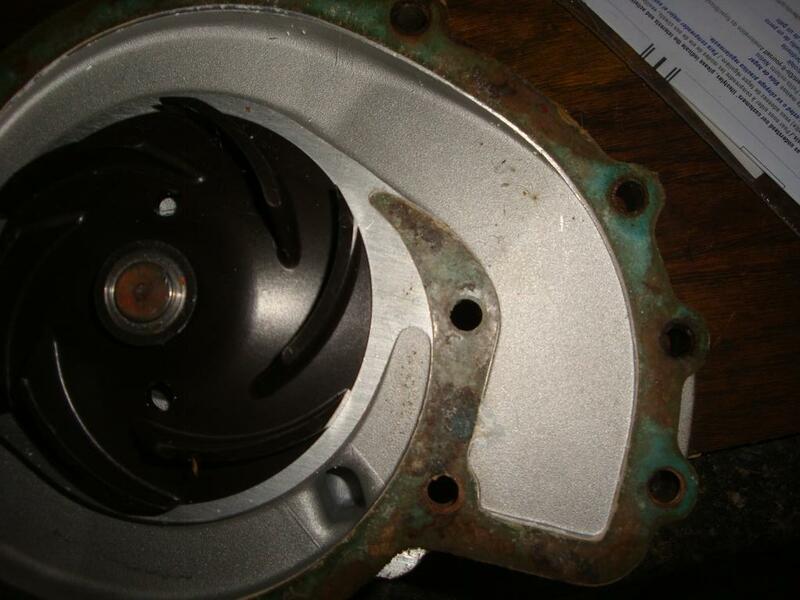 "Roger, I was under the impression that Ed didn't want to use a pump with a plastic impeller. Has he changed his thinking on this?" When Ed modifies a core pump he cannot/it is not easy to add a plastic impeller as it does not take kindly to being drilled and pinned - they shatter. When you start with a new Laso pump with a plastic impeller already in place it is the best of all Worlds. NO seizing water pump to destroy our interferance engines. 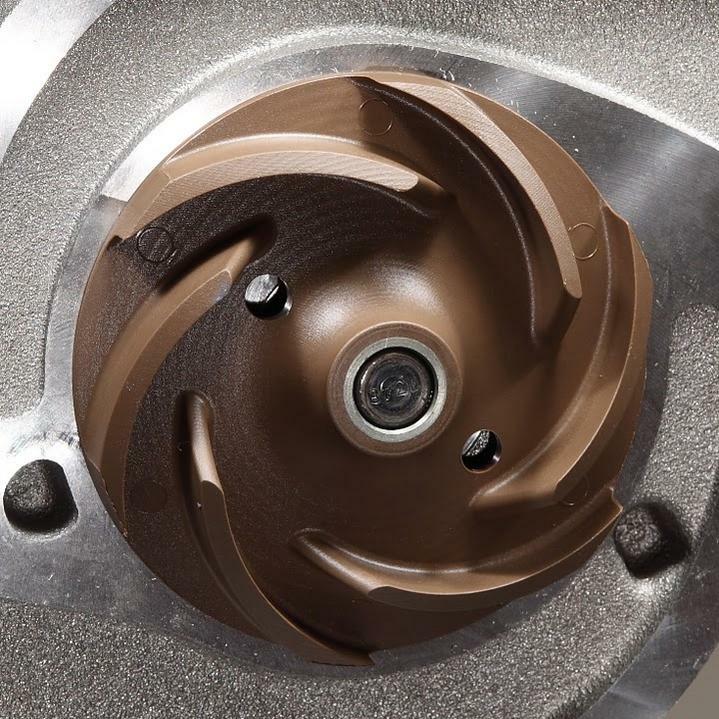 NO metal impeller to eat into the block. Many thanks to Ed and Roger. This is a huge step foward in our 30 year old engines. You guys rock! The holes look the same size to me, however I do not have one here to check. The decrease in land looks small on the hole you pointed out. There is a difference but is it of concern - I think not. The Laso design has not changed on the casting. So how many actual leaking water pumps have you seen? Or is this purely conjecture on your behalf? Nothing to do with me but thank you none the less. Laso for listening to the 928 community and making the modifications needed. Ed for taking the design to where it should have been in the first place. I've had the pleasure of studying Ed's design for about a month. I have one of his pumps sitting on my desk with the cover off. This is a very clever design and should solve most all of the water pump problems. 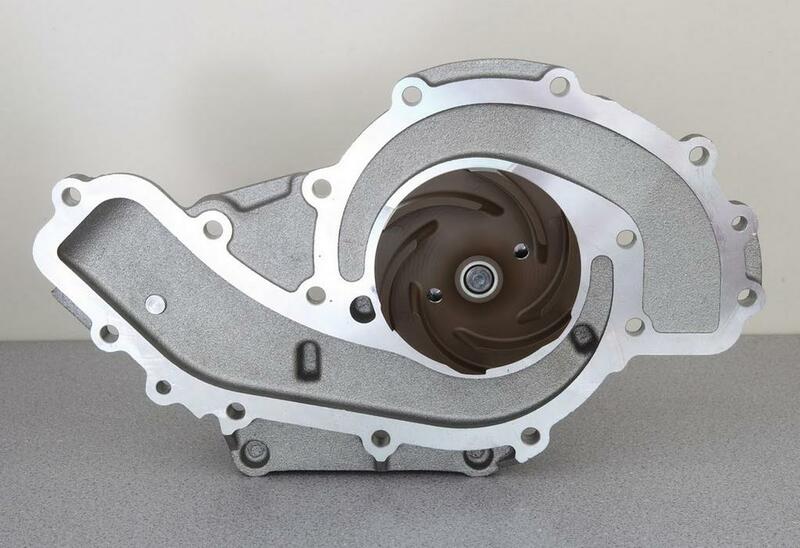 The only reason anyone ever wanted a metal impeller is that sometimes the Porsche plastic one would not stand up to the rapid acceration of an engine and would spin the plastic on the metal bushing that the plastic was formed around. I have no idea how robust the new Laso impeller is, but it looks very nice. There's always different ways to do a particular job. Ditto! Between this, a PKtensioner and a TT clamp, they're almost bullet proof. Thank you! I have a couple of "old" Laso pumps....the holes look exactly the same as the "new" Laso pictured. Great work on the development side, Ed! All times are GMT -3. The time now is 02:02 PM.